The A-26 was a fast and heavy-hitting attack bomber developed during World War II. Some models carried as many as 14 forward-firing fifty caliber machine guns and up to 6,000 pounds of bombs and rockets. England, 1944? No. It's Santa Rosa, 2014. Looking appropriately ominous in the twilight, the 1944-vintage A-26 sits inside the Butler Hangar, also built in the 1940s. The two go naturally together, and except for the 1950s era RF-8 Crusader nose in the background, you could almost think this was a World War II photo. 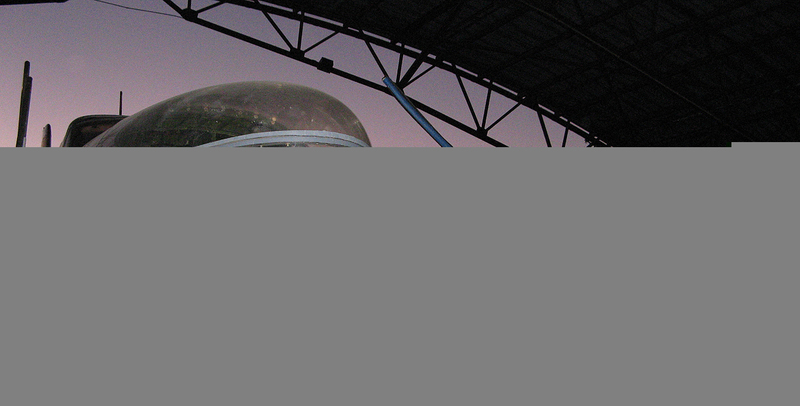 The dome on top of the plane housed two remote-controlled fifty-caliber machine guns. Another such turret was located in the belly. A gunner could control both guns simultaneously. These guns, along with the plane's top speed of 355 miles per hour, made the Invader a dangerous plane to attack. 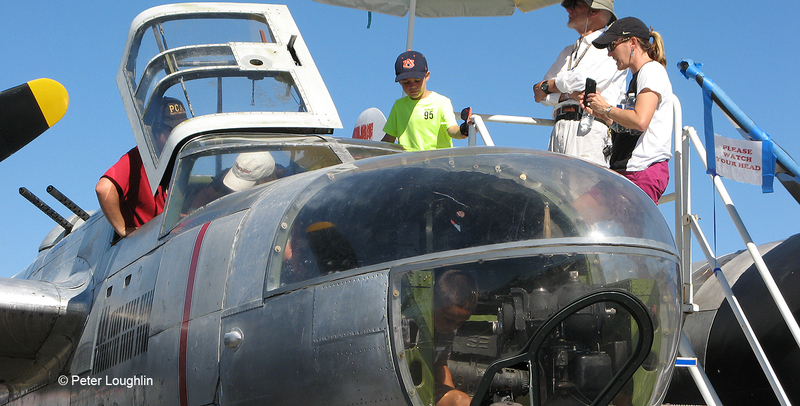 The A-26 has been a long-term restoration project. 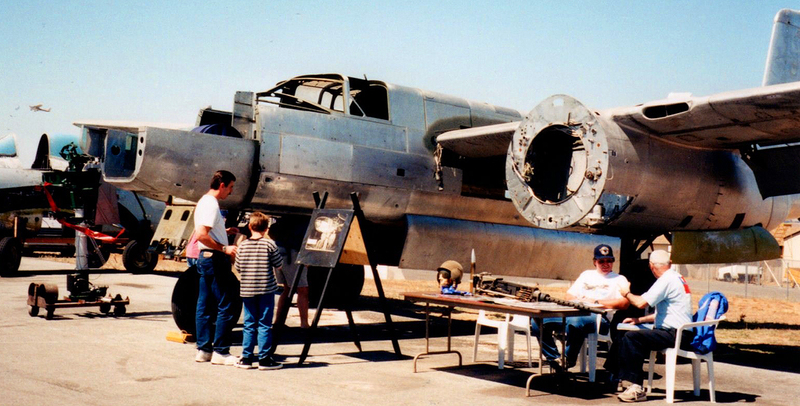 Shown at the Wings Over Wine Country Air Show in the late 1990s, it is still missing its engines, plexiglass and many other components. Look back at the more recent photos in this slide show and you'll see just how far our dedicated restoration crew has taken her! 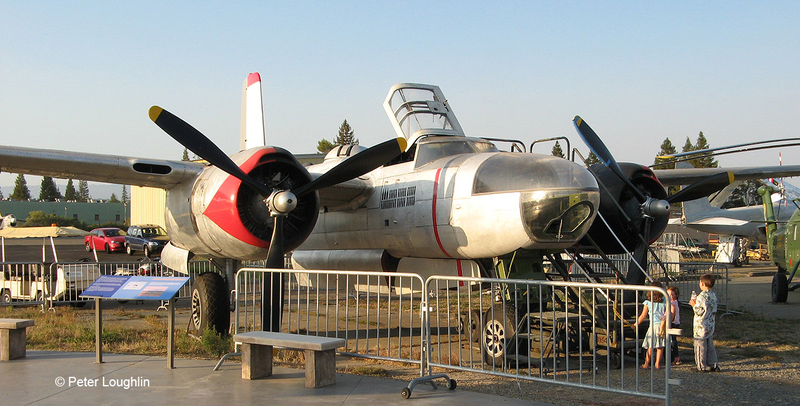 Way back in the early history of the Pacific Coast Air Museum, the A-26 Invader was our only aircraft. And it needed a lot of help! 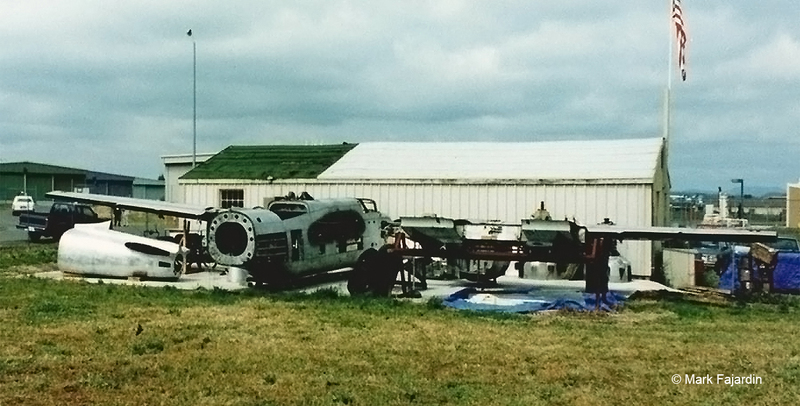 This photo is from around 1990, and the components of the plane have barely been cleaned up. But our early crew had a vision, and as you'll see from more recent photos in this slide show, that vision is nearly fulfilled! The A-26 Invader was first flown in July 1942 but design problems and equipment shortages delayed introduction to combat until 1944. It was built in 2 models, the "B" with a solid nose and the "C" with a glass nose. The Invader was the first bomber to incorporate laminar flow airfoils, slotted flaps and remote control gun turrets. 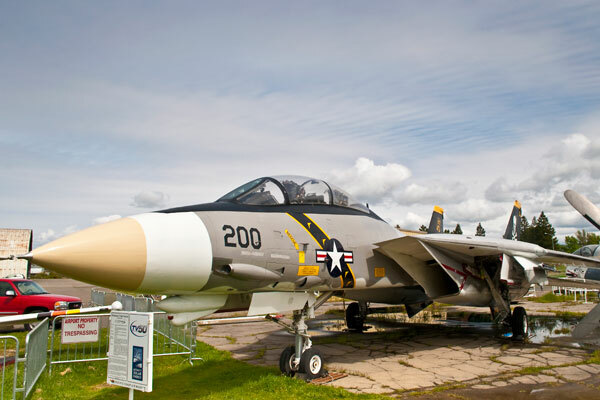 Production ended in 1945 with approximately 2450 aircraft completed. In 1950 with the onset of the Korean war the Invader was one of the first aircraft to be brought to bear on the enemy. 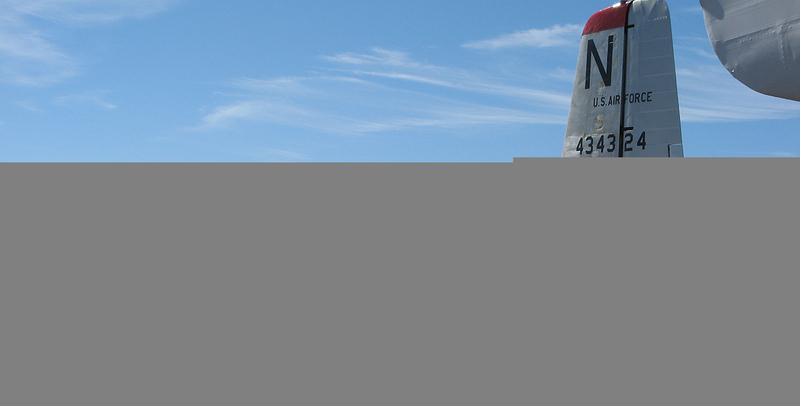 Now designated the B-26, it continued to see action until the end of hostilities in 1953. It was used almost exclusively on night missions. 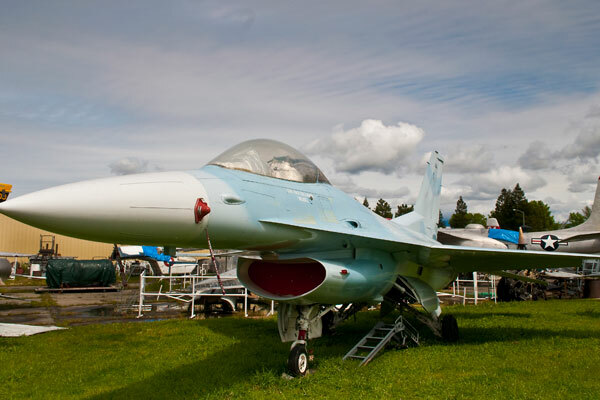 In 1954 it was phased out of the active Air Force inventory. 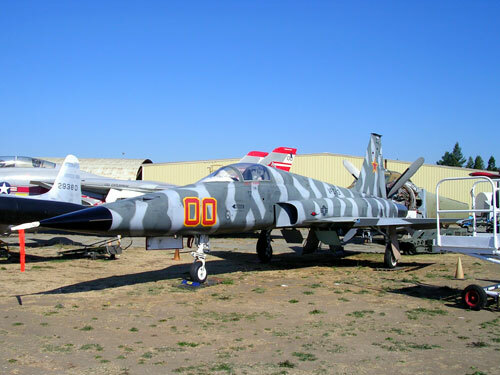 Starting in late 1961, small numbers of Invaders began arriving in Vietnam, eventually reaching 12 aircraft. The official mission was training Vietnamese pilots but in actuality some combat missions were flown. In 1963 the US Air Force decided to use the B-26 as a counter-insurgency aircraft as there were still many in storage. A contract was let for major rework and modification of 40 aircraft. In April 1965, the last Invader, now designated B-26K, was delivered. It soon was re-designated A-26A for political reasons. Its most distinguishing feature was the addition of 2 165 gallon tip tanks. Dual controls were also added for a copilot. Attrition and a shortage of parts forced the stand down of the last special operation squadron in November 1969. In addition to the Invaders primary roles of bombing and interdiction, it was modified to accomplish a wide array of other missions. These included reconnaissance, combat insertion, target drone launcher, personnel transport, and weather research. 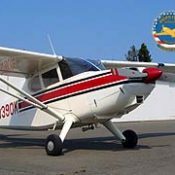 After being declared surplus, many entered civilian service as executive transports and fighting forest fires. Throughout the years, Invaders were used by over 20 foreign governments. The A-26B-15, S/N 41-39303, was manufactured by Douglas Aircraft, Long Beach, CA, and delivered to the USAAF on 9 Oct 1944. Oct 1944, Departed US for 9th Air Force (European Theater of Operations) via Hunter AAF GA.
Jul 1945, Returned US via Hunter AAF GA.
Dec 1945, To 4160th AAF Base Unit (Air Material Command), Grenada AAF MS (storage). Jul 1952, To 126th Bombardment (light) wing (US Air Forces Europe), Laon AB France. Nov 1952, To 38th Bombardment (light) wing (USAFE), Laon AB France. Mar 1954, To 66th Tactical Reconnaissance Wing (USAFE), Sembach AB Germany. Apr 1954, To 38th Bombardment (light) Wing (USAFE), Laon AB France (later 38th Bombardment (Tactical) Wing). Jun 1956, To Aircraft Storage Branch (AMC), Davis-Monthan AFB AZ. Dec 1956, To 1400th Field Maintenance Squadron (Military Air Transport Command), Keflavik AP Iceland. Sep 1957, To Middletown Air Materiel Area, Olmstead AAF PA. In 1958 it was declared excess and sold on the civilian market. Its last assignment was as a water bomber fighting forest fires. 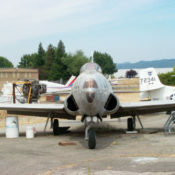 The Pacific Coast Air Museum acquired the aircraft in 1992 intending to restore it to flying condition. The A-26 Invader is the only aircraft type to see combat in W.W.II, Korea and Vietnam. Originally 27,000 lbs, later increased to 35,000 lbs with 38,5000 lbs maximum overload. Two Pratt and Whitney R-2800 radial (piston) engines. Fixed: Up to eight .50 caliber machine guns were located in the nose, two .50 caliber guns each in the dorsal and ventral turrets, and six .50 caliber guns in the wings. 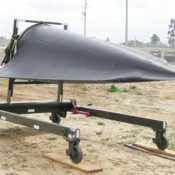 Disposable: Bombs, 4000 lbs internally and up to 2000 lbs under wing. Later this was increased to 6000 lbs total bomb load. Some versions could also carry rockets under the wings.